"Les Freses" a true author´s wine of La Marina AltaPromociones Denia, inmuebles en venta en la Costa Blanca con especial enfoque en La Sella Golf Resort, Denia. The Bañó family, co-founders of our company Promociones Denia and initiators of the La Sella Golf Resort Dénia are breaking new grounds, this time in the art of cultivating wine. 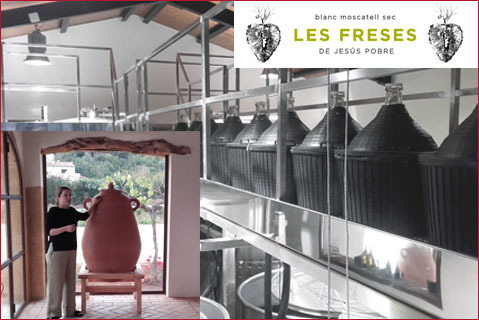 The white wine “Les Freses”, proceding from 100% Moscatel de Alejandría grapes grown on one single vineyard in the sunbathed area next to the Montgó´s south side, is surprising the best wine stewards as “interesting, of those you are not getting tired of”. A genuine author´s wine, of excellent quality which during its four years existence has increased the production considerably, aiming to achieve a maximum of 40,000 bottles once the vineyard has reached its maturity. Next to the vineyard is the bodega Les Freses, a typical Spanish country house, complety renovated in 2018, where the wine is produced, sold and tastings can be booked.